Simply put, E3 Embedded Systems designs and builds embedded development products & solutions… but, what our platform offers is much bigger. In fact, our new embedded platform is a game-changer. 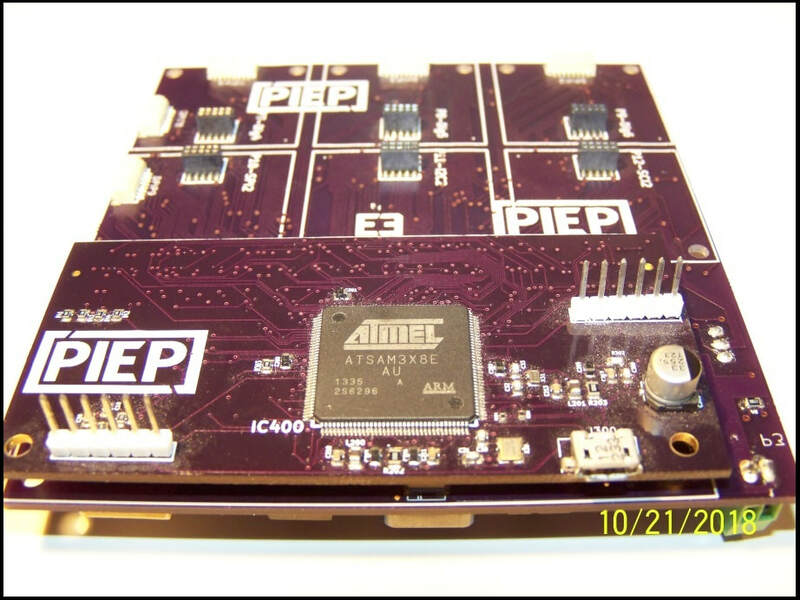 The (PATENTED) Processor Independent Embedded Platform (PIEP) helps creative people design, test and integrate their embedded solutions into field ready systems. We currently offer two form factors - (1) PIEP Standard (4x4") and (2) PIEP Mini (1.25x1.25")... more on that below. 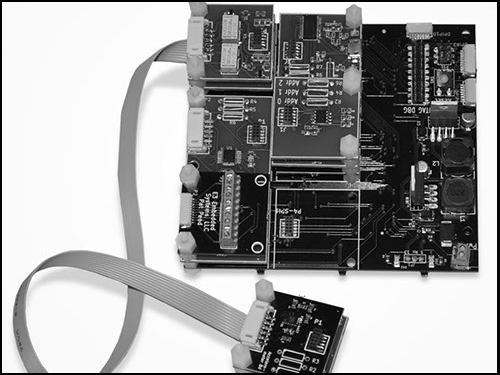 The PIEP motherboard does not contain a processor; rather, we offer a variety of processor boards that plug into (or snap into) the motherboard. 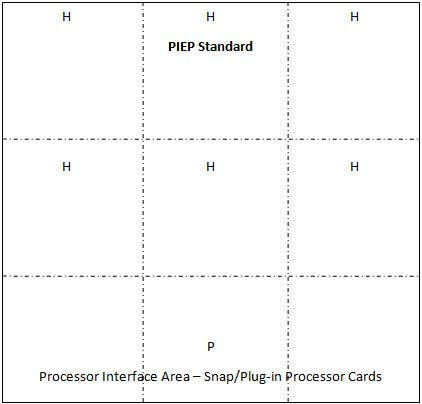 PIEP Standard supports four processors across three processor families: ARM, Freescale, and PIC (with more coming soon). Removable processor card. Change architectures by simply replacing the processor card. Maximum 'Stackablity' - Twelve (6 top / 6 bottom) Stackable Peripheral Interface Ports (SPIP) can support potentially dozens of peripheral cards (depending on your needs). Over 25 peripherals - All of our peripherals work with all of our processors, allowing you to use our products regardless of your preferred or chosen architecture (PIC, ARM, Freescale). Space saving design with a 4x4 overall footprint. 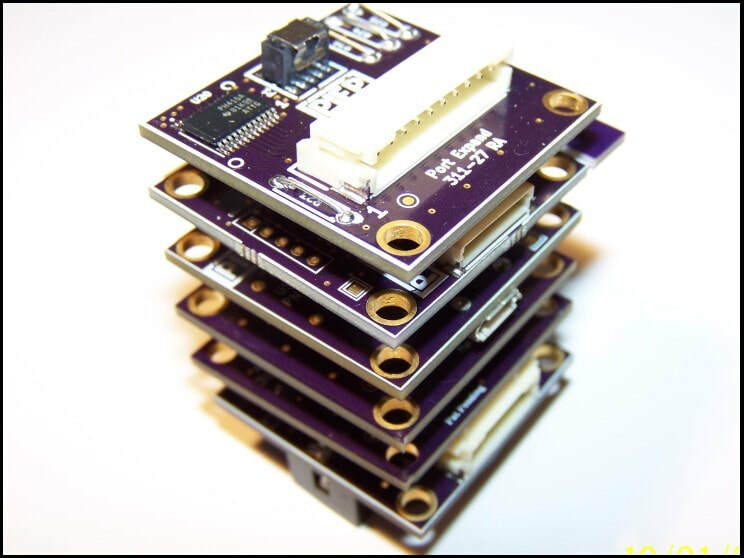 The fully populated board fits in a space that is approximately 4"x4"x2.5". Peripheral remote mount kits permit off-board installation of peripheral devices. Ease of use - For most projects, the only tools you will need are wire-cutters and a small screw-driver - pre-crimpled leads are supplied with our peripherals. Ten Direct Processor Interface Ports (DPIP) allow even more connection options. External connections made via JST 2mm (SPIP) or 1mm (DPIP) connectors. Wide range, 9-24 Volt DC, input converted to 3.3 & 5 Vdc @2A via on-board supplies. Seamless integration with third party hardware. Good for low power consumption needs. PIEP Mini processor boards have the same form factor as 95% of PIEP peripherals. We currently only have one processor for PIEP Mini (TI CC2541); however, more are in development. You can stack peripherals above and below the processor board. For PIEP Mini, processor independence is as simple as replacing the processor board in the stack. Many of the same features listed above. 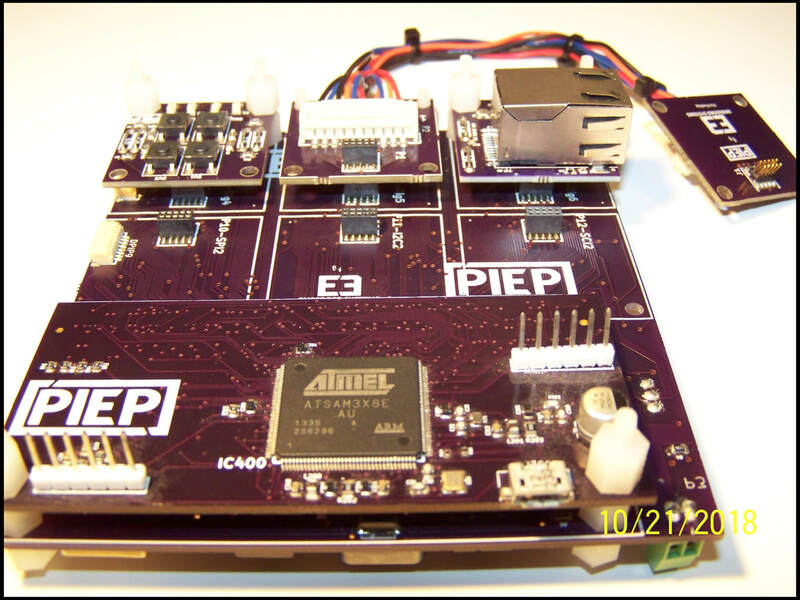 PIEP supports a minimum of four different form factors / configurations; E3 Embedded Systems currently offers 2 of the 4. 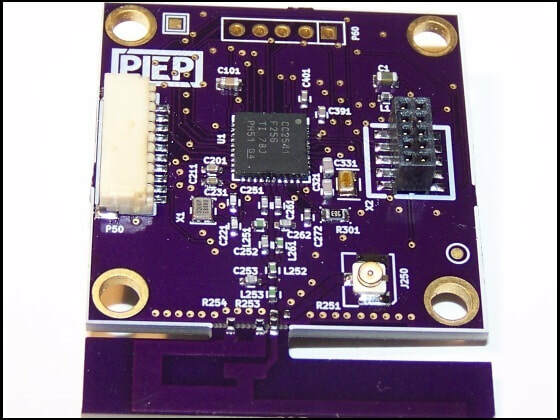 Do you need a solution that is not resource intensive and requires low power, then the PIEP MINI may suit your needs. At the other end of the spectrum, maybe you need a very robust system that utilizes a high-end processor. For those situations PIEP Standard may be your choice. 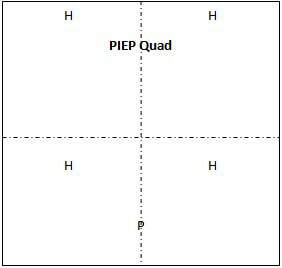 Maybe you need something in the middle... the PIEP Double or Quad may work well for you. All of our peripherals have a form factor of 1.25x1.25" (small square) or 1.25x2.5" (small rectangle - such as our H-Bridge board). But, the PIEP Platform allows us to create peripherals in other sizes to... L shaped (i.e. 3 squares), 1.25x3.75 (row), 2.5x2.5" (large square) or even 2.5x3.75 (two rows). 95% of our peripherals will work with all form factors. 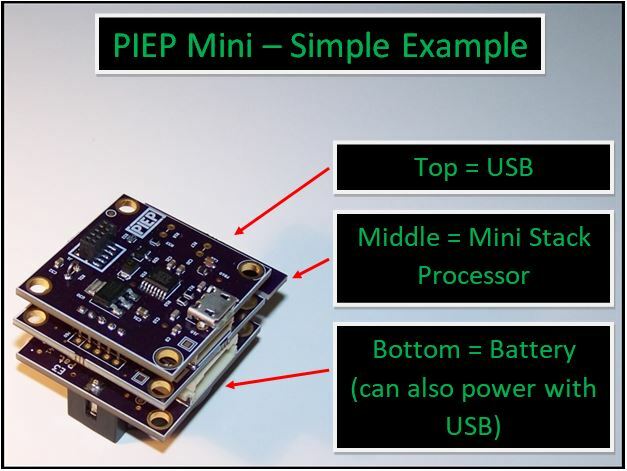 So, if you use the PIEP Mini for your first few projects but later need to upgrade to the PIEP Double, Quad or Standard, you can re-use the peripherals that you used on your PIEP Mini projects.